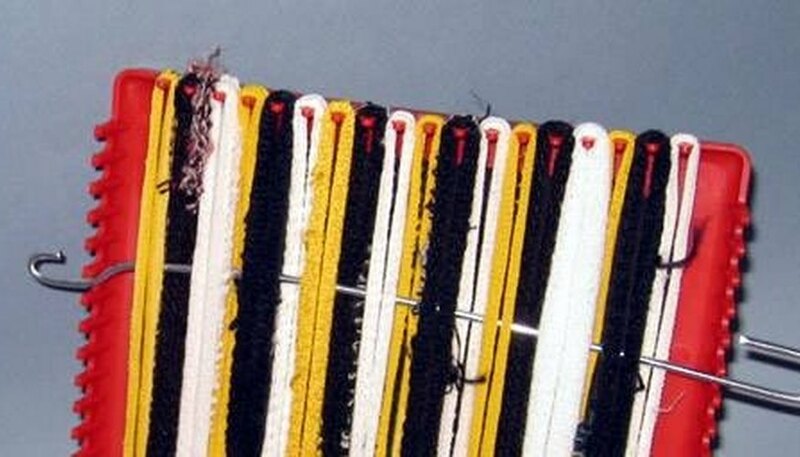 Peg loom pot holders are woven on a small square loom with approximately 18 pegs on each side. 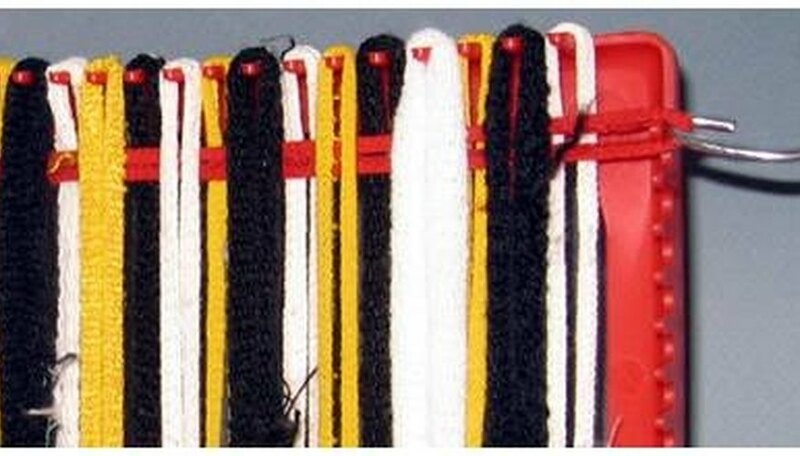 The loops used to weave the pot holders are made from a seamless, stretchy cotton material cut specifically for the loom, and are available at craft supply stores where the loom is sold. 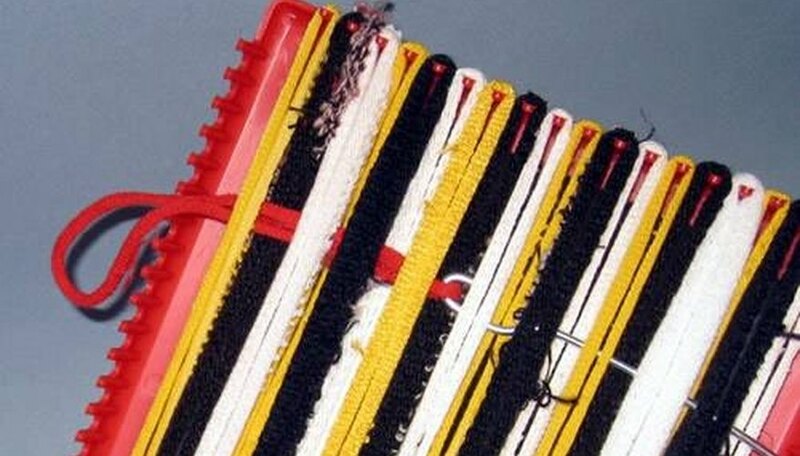 Some looms are sold in kits that contain everything you need to make a pot holder. Sort your loom loops and lay out 36 that are large enough to stretch across the loom from peg to peg. Packages of loom loops contain a variety of colors and sizes. However, some are too small to use on the loom and need to be discarded. 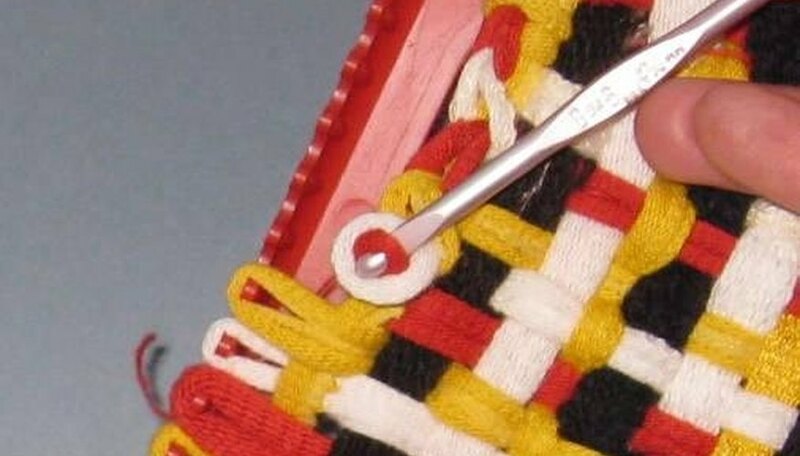 Overly thick loops should be discarded too, as they have a tendency to pop off the pegs while you're weaving. Hold the loom in your lap and start by stretching loops horizontally and hooking them over pegs on opposite ends of the loom. You can use your fingers for this; no hook is necessary. Don't use any loop that doesn't stretch comfortably across the loom. 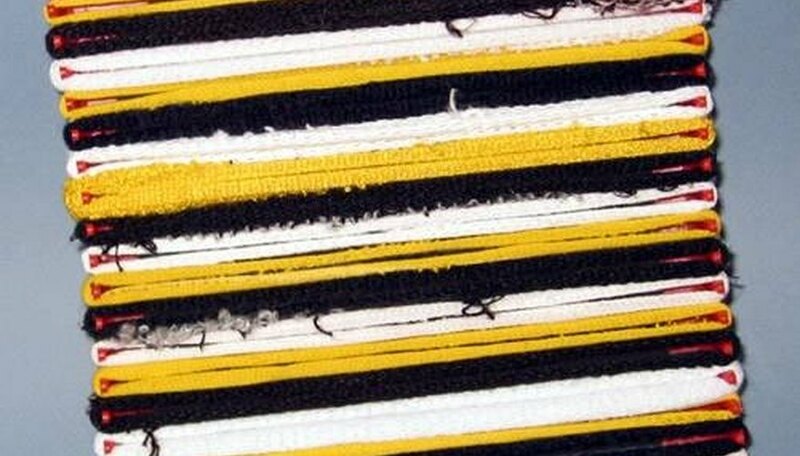 Loops that are too small or not stretchy enough may bend or snap the pegs off the loom if you try to force them on. 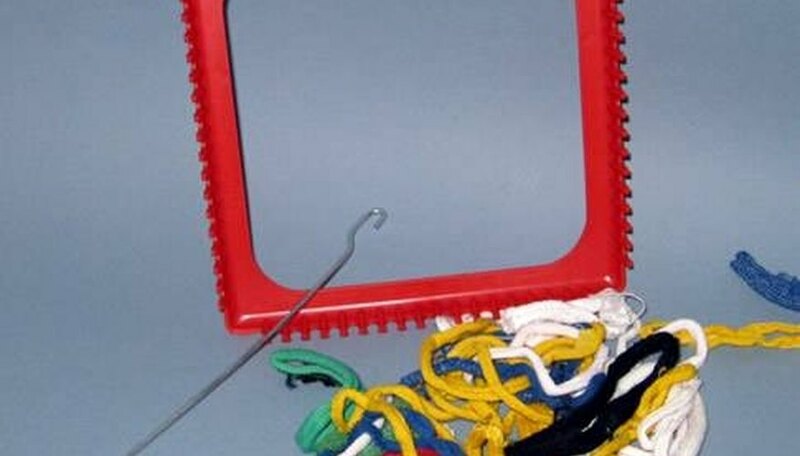 Pick up the loom hook. If it has a hook on each end, use the smaller of the two hooks. 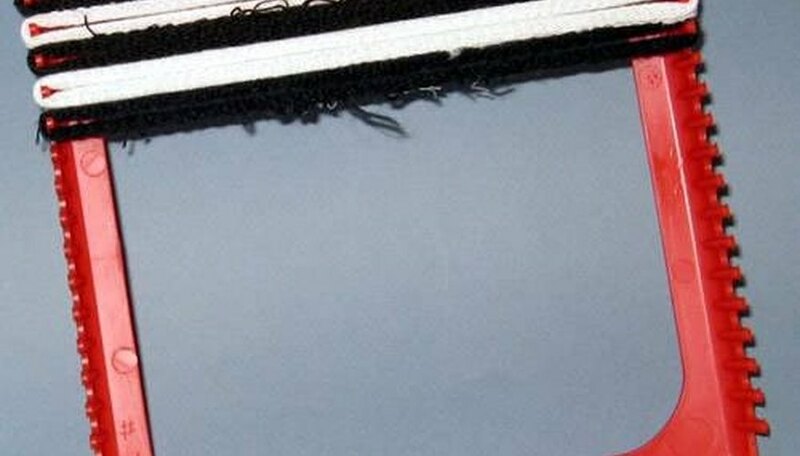 Working in an over-under-over-under manner, slide the metal loom hook over the first stretched loop, then under the next, then repeat over and under, weaving the hook through the stretch loops. 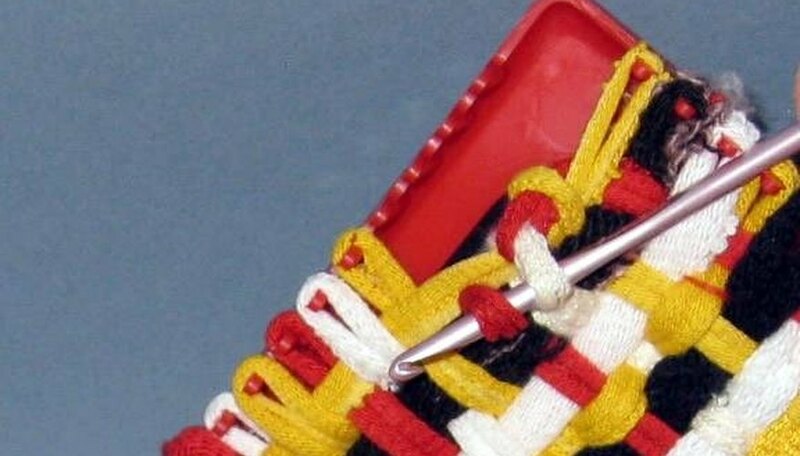 Place an unused loop on the end of the hook when it comes out the other side and, keeping the loom hook on its side so it lies flat, slowly and gently pull the new loop back cross the loom, dragging it over and under the first layer of stretched loops. 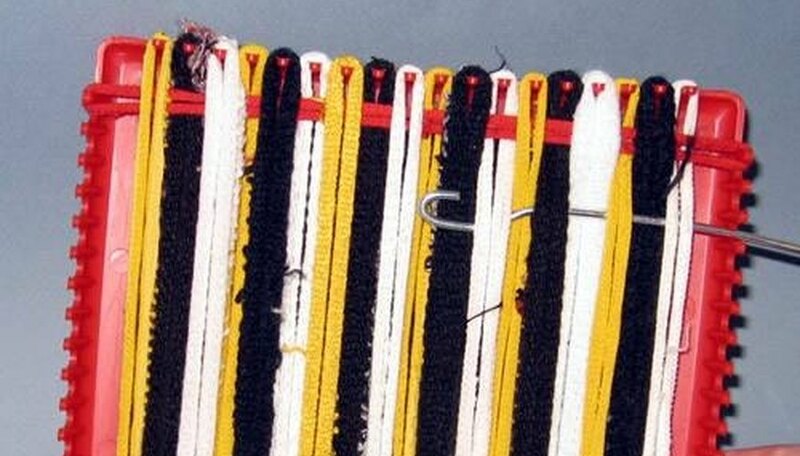 Place the trailing end of the loop on the far peg as your hook gets closer to the starting edge to keep it from disappearing into the middle of the loom. Pull the loop strand tight as the hook emerges on the starting side, place it over the peg and remove the hook from the loop. 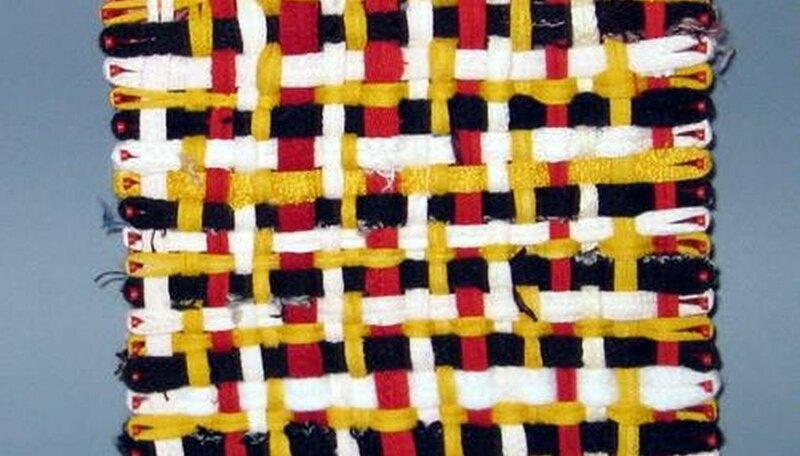 Start the next row doing the opposite weaving motions of the previous row. This time do an under-over-under-over pattern with the hook. Attach a free loop on the other side of the loom and pull it back through as you did in Step 2. Laying the hook flat against the weave as you work will make it easier to pull through the stretched loops. Otherwise, the hook is likely to snag a piece of material as it passes over or under. 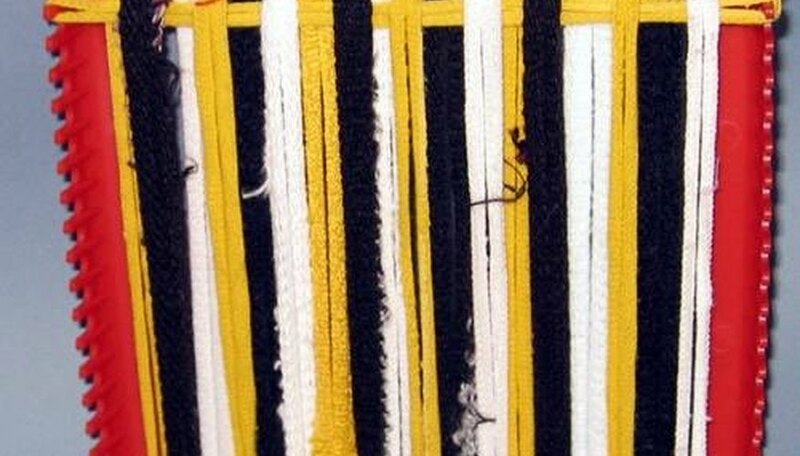 Repeat Steps 1 through 6 to weave loops on to the remaining pegs. Go slowly when you get to the last couple of rows. These will be very tight and the first layer loops are likely to pop off the pegs if you pull the hook up too much while sliding it over and under as you go across. Start in one corner and place the first loop on a crochet hook. Place the adjacent loop from the same side on the crochet hook. Pull the second loop through the first loop so you only have the second loop on the hook. Repeat Steps 2 and 3 across the entire pot holder until you have only one loop left in the last corner. This loop can be used to hang the pot holder. Be sure to pull it tight so the loops don't separate. You may want to secure the final hanging loop with a needle and thread so it doesn't come undone with use or in the laundry. 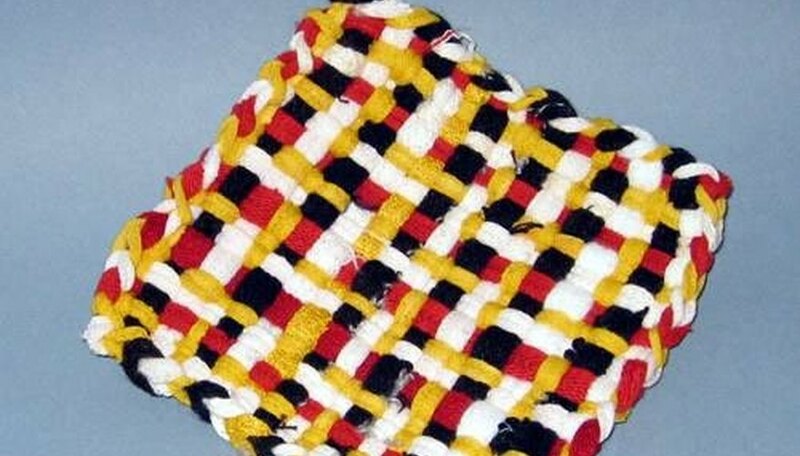 The pot holders created on these craft looms are only about 6 inches across and may be too small to adequately protect your hands from hot surfaces.